My last empties post was back in December (link here) and as they're one of my favourite type of posts to write I thought it was about time I shared another one. I purchased Collection Illuminating Concealer in the shade 'Natural' for the first time late last year and I was really impressed with it. It's a really good budget concealer which is the perfect shade match for my skin tone. I use this product to help conceal imperfections and to brighten areas which appear dull/dark (such as my under eye area) without feeling heavy on my skin. I will definitely be repurchasing this product. I've genuinely lost count of how many times I've featured LUSH's Lord Of Misrule Shower Cream on my blog now. It's one of my all-time favourite scents, and it works very well as a shower product too. Unfortunately this was a limited edition product from the LUSH Halloween Collection but I did manage to stock up on my recent visit to LUSH Oxford Street. Coconut Oil is a product which I would highly recommend having in your beauty stash, it's a great multi use product and a little goes a long way. As I currently only use it for beauty purposes I buy Superdrug's own brand coconut oil, which can be bought really cheaply for a couple of pounds. 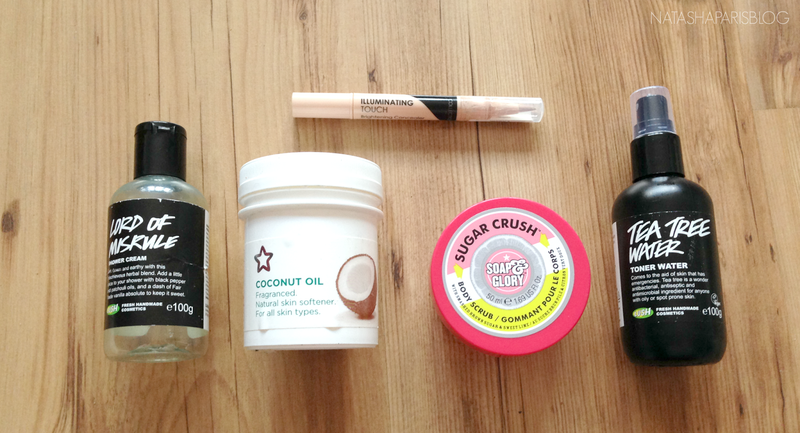 I have previously written a blog post about my favourite beauty uses for coconut oil which you can find here. I've already made a start on a new tub of coconut oil and I'm sure I'll continue to repurchase again and again. I've been using Soap & Glory Body Scrubs on and off for a very long time now. I've recently finished my pot of Sugar Crush Body Scrub, a body exfoliator which I've found isn't too harsh on my skin but works effectively leaving my skin feeling soft. However, Sugar Crush isn't my favourite Soap & Glory scent, I found it to be almost artificial smelling, so I think I'll switch back to Soap & Glory Flake Away next time. My final product empty is LUSH Tea Tree Toner Water, a product I like to use as part of my night time routine. I spritz some of this product onto a cotton pad (I'm too much of a wuss to spritz directly onto my skin) after cleansing to remove any last traces of make-up. It helps to keep my spots at bay but also feels really refreshing when applied to tired skin. I've already opened a second bottle of this product and it's one that I'd recommend looking into if you have the type of skin that can be a little problematic (like I do). What products have you used up recently? Would you recommend them?